Walk the Pilgrim's Path and return the Skeleton Key to its rightful place. Speak to the Nightingale Sentinel. Unlock the Ebonmere with the Skeleton Key. "I don't recognize you, but I sense that you're one of us. Who are you?" "The last of the Nightingale Sentinels, I'm afraid. I've defended the Sepulcher alone for what seems like an eternity." "We were betrayed by one of our own kind. In fact, I'm to blame for what's happened here." "I was blinded. Blinded by dark treachery masquerading as friendship. Perhaps if I had been more vigilant, then Mercer Frey wouldn't have lured me to my fate and stolen the Skeleton Key." "I haven't heard that name in a long time. How do you know of me?" "The Key! You have the Skeleton Key! I never thought I'd see it again. And Mercer Frey?" "Then... it's over and my death wasn't in vain. I owe you a great deal, Nightingale." "I did this for Nocturnal." "I did this to honor the Guild." "I did this to get rich." "That's quite a noble sentiment for someone in our... well, in your line of work." "You've done the Guild a great deed. And although they may not show it, I'm certain they appreciate your sacrifices." "Were I able to provide it, I'd shower you in wealth for what you've done." "My only regret is that you had to undertake this task alone." "Karliah... she's still alive? I feared she'd befallen the same fate, ending up a victim of Mercer's betrayal." "Then take the Key and right all the wrongs." "Nothing would bring me more pride than to return the Key, but I'm afraid it's impossible. From the moment I arrived here, I've felt myself... well... dying." "How can a spirit die?" "The Sepulcher isn't merely a temple or a vault to house the Key. Within these walls is the Ebonmere... a conduit to Nocturnal's realm of Evergloam. When Mercer stole the Key, that conduit closed, severely limiting our ties to her." "Then I'll have to proceed alone." "I'm afraid so. I'm weakening, and I can feel myself slipping away. The years without restoration of my power have taken their toll. Whatever damage has been caused can only be corrected by following the Pilgrim's Path to the Ebonmere and replacing the Key." If you inquire further about the Pilgrim's Path, Gallus will say "I wish I could help you, but I've been a prisoner in this very chamber for the last quarter century. The only possible help I've come across are the remains of some poor fellow who was trying to follow in your footsteps. Perhaps his journal can help?" This will present you with an optional goal to retrieve Nystrom's journal, which contains clues about the five "tests" you will face along the way. The journal is found on Nystrom's remains on the east side of the chamber, along with a leveled, enchanted weapon. "Shadows of their former selves, sentinels of the dark. They wander ever more and deal swift death to defilers." Continue into the Sepulcher. In the first chamber, you will notice two Nightingale Sentinels reside here. One will be found in a room to the left, along with an alchemy lab and a secret chamber. The door to the secret chamber can be opened by pressing a button found behind the table. The other Sentinel can be found wandering near the steps in the main room. Starting a fight risks gaining the attention of both of them, so you can either choose to fight or try your luck in sneaking past them. Proceed onward into the next hallway, being mindful of the pressure plate in the hallway. On top of the stairs ahead, there is another Sentinel keeping watch. Note that the stairs themselves are pitch-black, but do not have any traps. Be careful however: if you use any form of light, it will likely attract the Sentinel. "Above all they stand, vigilance everlasting. Beholden to the murk yet contentious of the glow." The next chamber (and the second test you will face) is a room with brightly lit areas and a shadowy path running through them. Stick to the shadows here, since stepping into the light will result in continuous health damage that can quickly kill you. Note that if you're trying to level Restoration, this is a good place to do so; it is impossible to resist the damage (even with console commands or the Become Ethereal shout) as the damage caused by the light is scripted and will drain your health very rapidly (up to 100 points of damage per second) regardless of your level. The light damage is also affected by game difficulty, so be especially cautious if you are playing at higher difficulties. There are several tripwire-triggered dart traps along the shadowy path: the first one can be found as you make your way up the first flight of stairs, across the landing just ahead of you; the second tripwire is located just before you descend the second flight of stairs; the third tripwire is found just before you travel across a wooden bridge; the last one is located at the top of the last remaining stairs descending down. Once you reach the end of the chamber, proceed onward through the hallway until you reach the next room. "Offer what She desires most, but reject the material. For her greatest want is that which cannot be seen, felt or carried." 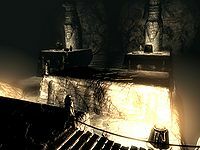 The third chamber is located at the end of the hallway, and contains a statue of Nocturnal, a dead bandit found on the floor, and a wooden tray with an offering of gold and soul gems. The third test along the Pilgrim's Path requires you to give Nocturnal an offering she desires: Darkness. In order to do so, find the chains hidden behind the stone torches on either side. Pulling both chains will put out the flames, creating darkness. This will cause a hidden passage to open from behind the statue, leading to a corridor and your fourth test. "Direct and yet indirect. The path to salvation a route of cunning with fortune betraying the foolish." The corridor that lies ahead has a path leading directly through to a door. However, this path contains multiple traps, including two pressure plates (which both trigger darts to be released from the ceiling) and a pendulum trap. If you choose to brave the pendulum trap, beware: at the end there is another pressure plate to the right which triggers a spear trap from multiple sides of the room. Opening the door ahead releases a battering ram from behind the door. You can also choose to avoid that path by going through a master-leveled locked door (easily opened with use of the Skeleton Key), which is located to the left side just before the pendulum trap. This path leads to a small chamber which has two Nightingale Sentinels guarding the area. This area also contains a copy of the Lockpicking skill book Proper Lock Design (on the table near the southeast corner of the room), some gold, several bottles of poison, and other minor loot. A copy of the Sneak skill book Sacred Witness may be on the table near the altar on the northwest side (see bugs). You may now continue through the corridors until you reach the door leading into the Twilight Sepulcher Inner Sanctum. "The journey is complete, the Empress's embrace awaits the fallen. Hesitate not if you wish to gift her your eternal devotion." Proceed unopposed down a hallway and through a second set of doors, opening into a room with a well. It is advisable to save before jumping in due to a large number of potential bugs. You may suffer a small amount of health damage from the fall. 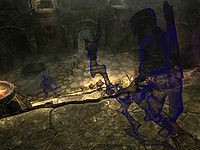 Examine the skeletal remains of Anders, the thief who is mentioned in Nystrom's journal. 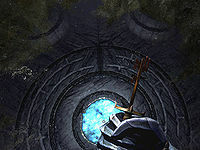 A cutscene is triggered shortly afterwards, and the floor of the well descends to reveal a room with three closed doors and a lock at your feet (which requires the Skeleton Key). Use the key to re-open the Ebonmere. Nocturnal will then emerge from the Ebonmere. Nocturnal: "My, my. What do we have here? It's been a number of years since I've set foot on your world. Or perhaps it's been moments. One tends to lose track. So... once again the Key has been stolen and a "champion" returns it to the Sepulcher. Now that Ebonmere has been restored, you stand before me awaiting your accolades; a pat on your head... a kiss on your cheek. What you fail to realize is your actions were expected and represent nothing more than the fulfillment of your agreement. Don't mistake my tone for displeasure, after all, you've obediently performed your duties to the letter. But we both know this has little to do with honor and oaths and loyalty. It's about the reward; the prize. Fear not. You'll have your trinkets, your desire for power, your hunger for wealth. I bid you to drink deeply from the Ebonmere, mortal. For this is where the Agent of Nocturnal is born. The Oath has been struck, the die has been cast and your fate awaits you in the Evergloam. Farewell, Nightingale. See to it the Key stays this time, won't you?" You are now directed to speak with Karliah, who has appeared inside the Sepulcher. "I'm glad you were able to bring the Key back safely. Nocturnal seemed quite pleased with your efforts." "I wouldn't take that to heart. It's her way. Think of her as a scolding mother continually pushing you harder to be successful; outwardly sounding angry but silently content. I assure you, had she been displeased with you, we wouldn't be having this conversation." "The circles at the base of the Ebonmere imbue you with powers befitting a Nightingale Agent. The crescent moon represents the Agent of Shadow, the half moon for the Agent of Subterfuge and the full moon for the Agent of Strife." Agent of Shadow (Crescent Moon) - Use this power to be invisible for 2 minutes while sneaking. "The Agent of Stealth is the master of remaining unseen. They are able to manipulate the darkness and use it to their advantage. On moonlit nights or in darkened rooms, this agent literally becomes invisible." Agent of Subterfuge (Half Moon) - Use this power to cause all nearby enemies to fight each other for 30 seconds. "The Agent of Subterfuge utilizes shadow to cloud the judgement of those around him. By weaving the darkness to their will, this agent can manipulate others into fighting for the Nightingale for a limited time." Agent of Strife (Full Moon) - Use this power to invoke a powerful life-drain effect. "This [sic] Agent of Strife can send forth a tendril of pure darkness into the heart of another, causing great injury to them. At the same time, this tether will bolster the agent's own life force, making him stronger."" If you ask Karliah why you cannot be all three Agents at once, she will respond with "This is Nocturnal's way of maintaining balance. If you ever feel the need to change your abilities, you can return to the Sepulcher and step onto a different circle. Be warned that once you've chosen, you can't reselect for at least a day." "Now, your life as a Nightingale begins. Should the need arise, you'll be summoned to the Sepulcher in order to defend it." "The Guild has welcomed me back with open arms. I feel like a void in my life has finally been filled. I only hope that this isn't an ending to things, but actually the beginning." "Why, perhaps the greatest crime spree Skyrim's ever known. There are pockets brimming with coin and coffers overflowing with riches ripe for the picking. We may be Nightingales, but in our hearts we're still thieves and we're damn good at what we do." You can now return to the Nightingale Hall and use it as a home if you wish. Karliah will also reside there. 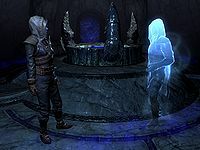 Before you leave the Twilight Sepulcher however, there is a short cutscene where Gallus appears and speaks to Karliah before entering the Evergloam. Karliah: "Gallus! I feared I would never see you again. I was afraid you'd become like the others." Gallus: "If it were not for the actions of this Nightingale, your fears would have come true. He/She honors us all." Karliah: "What will you do now, my love?" Gallus: "Nocturnal calls me to the Evergloam. My contract has been fulfilled." Karliah: "Will I ever see you again?" Gallus: "When your debt to Nocturnal has been paid, we'll embrace once again." Karliah: "Farewell, Gallus. Eyes open... walk with the shadows." "Gallus's Oath has been paid. His actions have satisfied the terms. Now his spirit becomes one with the Evergloam... the realm of perpetual twilight and the cradle of shadow." "No, not gone... he's become one with the shadows. This is the greatest honor a Nightingale can possibly achieve. In death, he's become a part of that which we use to live." "They're a part of the darkness around us?" "Absolutely. When we say "walk with the shadows," we are asking those Nightingales who have passed on to protect us. It's believed that they are literally what guides our uncanny luck... by placing their hands in ours. That's why the Ebonmere needed to be reopened. Without it, there's no way Nocturnal was able to allow them through." To exit the Sepulcher, you can enter through either of the portals surrounding the Ebonmere. 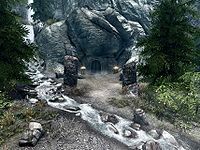 The portals will take you directly to the entrance of the Sepulcher, and if you look back, you will notice that the path that once led to the Pilgrim's Path now has a portal which will take you directly to the Inner Sanctum. Once you've returned to the Thieves Guild, Brynjolf will greet you by remarking, "It's good to see you in one piece lad/lass!" He will then go on to say: "I just wanted to give you a proper thank you for everything you've done. The Guild is back on its feet again and on its way to a prosperous future." He will also ask about the Skeleton Key. 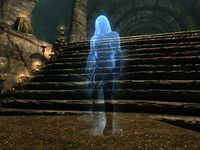 When you say that you've returned it back to the Sepulcher, Brynjolf will reply: "That's it then. After all of those years of helplessly watching the Guild decline. But enough of that... I'm confident that with you in charge, we'll soon have more gold than we could possibly spend." Asking where he will be from now on will cause him to say: "I'll be down here, trying to coordinate everything with Delvin and Vex; to make sure the coin keeps flowing... and no one skims! If you still feel like doing some jobs, I'm sure Delvin and Vex have more than their fair share to give out. Either way, it's been a pleasure, my friend. Here's to the future of the Guild. May it last another thousand years!" If you have already completed the reputation quests, then you can now complete Under New Management, the last main quest available for the Thieves Guild. However, you are still able to complete jobs given by either Delvin or Vex. The completion of this quest will remove the Skeleton Key from your inventory permanently. If you already have Nystrom's journal when you get the objective to retrieve it, re-read the book to complete the objective. Gallus's Encoded Journal cannot be removed from your inventory after the quest is completed. The following console command will fix this: player.removeitem CEDA6 1. Alternatively, if you wish to keep it, using player.drop CEDA6 1 will drop the journal and not delete it. 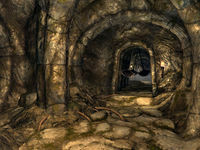 Entering the Twilight Sepulcher, hearing the first of Gallus's dialogue, and then leaving will cause the door to the Pilgrim's Path to stay closed and never open upon returning. This will be caused by "Nightingale Sentinel" being replaced with "Gallus" after exiting dialogue with him. Speaking with the "Gallus" version of the sentinel with all topics will not cause the door to open because he does not have the proper permissions. ? Solution: If you go to the right around the door of the Pilgrim's Path, you will see a glitched area that can appear blue. You will also see the inside of the Pilgrim's Path. Use the Whirlwind Sprint shout to jump the gap and gain entrance to the path. Falling will either return you to the entrance area or kill you, depending on how you fall. The objective will not reappear until you talk to Nocturnal near the end of the quest. After going through the well and dropping into the main chamber, Karliah may not show up at all, show up and leave promptly, or show up late. It may help to wait a few hours before dropping into the well in order to have Karliah show up. It may also be helpful to NOT loot Anders upon dropping into the well. Karliah needs to be present for the whole conversation with Nocturnal, so ensure you save the game prior to dropping into the well and load up each time until it works properly. As the conversation ends, she may try to leave, so ensure that you are next to her and ready to speak as soon as Nocturnal goes away and your quest updates to "Speak with Karliah". If the quest doesn't update after Nocturnal tells you to drink from the Ebonmere, simply wait a few hours and the quest should update. ? If Karliah is not showing up, it is possible to finish the quest with the console. While Nocturnal speaks, spawn Karliah with player.placeatme 1B07F. When Nocturnal is finished, you may need to update the quest with setstage TG09 60. This quest may halt after you are able to receive one of the three abilities and Karliah has spoken to Gallus. Her dialogue says she will return to Nightingale Hall, but she stays there for 24 hours, then ends up in Snow Veil Sanctum. She also states that a portal will exist in Nightingale Hall, but none is there; in fact, nothing changes at all. Brynjolf shows up in the Thieves Guild (with his old Thieves Guild gear on, not the Nightingale gear) but just says "I'm busy, talk to me later." ? At the end of the quest, after Nocturnal speaks to you, you're instructed to speak to Karliah. However, in some cases all she says is "Yes, fellow Nightingale?" and gives no dialogue options. ? This seems to be caused by completing Hard Answers a second time. It helps to wait for a few hours after inserting the key. The game will reload upon completion of the wait with Karliah where she needs to be. When you pull the chain next to the Nocturnal Statue during the third test, the lights will go out but the door will remain shut. ? The Sacred Witness skill book may not be present. 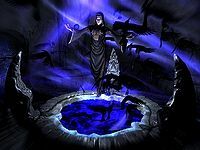 If you haven't read the Sacred Witness located in either of the Dark Brotherhood Sanctuaries, the one here will not appear. 10 With the Skeleton Key of Nocturnal safely in my possession, I'm bound for the Twilight Sepulcher to return it to its resting place. 30 Within the Twilight Sepulcher, I happened upon the spirit of Gallus, the Nightingale murdered by Mercer Frey. He warned me that removing the key from its resting place has corrupted the other resident Nightingale Guardian Spirits, distorting their morality and making them incredibly hostile. 200 Finishes quest I've returned the Skeleton Key to its proper resting place within the Twilight Sepulcher and encountered Nocturnal herself. As a reward for my actions, she allowed me to become a true Nightingale Agent and imbued me with the appropriate ability befitting my station. The following empty quest stages were omitted from the table: 0, 45. On the PC, it is possible to use the console to advance through the quest by entering setstage TG09 stage, where stage is the number of the stage you wish to complete. It is not possible to un-complete (i.e. go back) quest stages, but it is possible to clear all stages of the quest using resetquest TG09. This page was last modified on 15 January 2019, at 09:20.